Colorful with simple lines! We opened up this long narrow kitchen by removing the wall between it and the dining room, mud room/pantry, and bathroom. 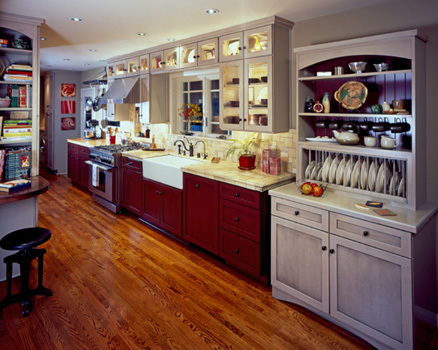 The burgandy and gray stained cabinets brings a furniture quality to the space and is brought to life with accent lighting. The tile backsplash and counters add warmth and texture. All new appliances complete the transformation.